Do your gums bleed when you brush or floss? Bleeding gums are never normal. In fact, they are the first sign of periodontal disease, an infection that affects not only your gums and teeth, but also your whole health. If your gums bleed when you brush or they are at all red or swollen, please call Ryan Lanman DDS MSD, or ask your general dentist for a referral right away. As a periodontist, Dr. Lanman offers a full range of treatment options to get your gums back to total health. Studies published in the New England Journal of Medicine and the Journal of Periodontology report that the inflammation of gum disease can cause bacterial byproducts to enter your bloodstream, triggering your liver to make proteins such as C-reactive protein. This protein is one of the main markers in all kinds of systemic inflammation that can increase the risk of blood clots and, according to a new study from Harvard, pancreatic cancer. The Harvard study shows that men with gum disease were 63 percent more likely to develop pancreatic cancer when compared to those with no periodontal problems. And that is just the tip of the iceberg. Why Should I Worry About Gum Disease? According to the American Academy of Periodontology, one in every two adults age 30 and older are suffering from gum disease and yet this disease is often overlooked, ignored, or minimized. In spite of its prevalence, periodontal disease is hardly ever discussed, and that results in a lack of urgency to deal with it – and that is dangerous! Periodontal disease can lead to receding gums, bone damage, loss of teeth, and can increase the risk of other health problems such as heart disease, strokes, certain cancers, rheumatoid arthritis, Alzheimer’s disease, low birth-weight babies, inflammation, and can even worsen diabetes. In addition, if the disease isn’t diagnosed and treated in the initial stages, the only solution is tooth removal due to severe bone loss. How can I Know If I have Gum Disease? 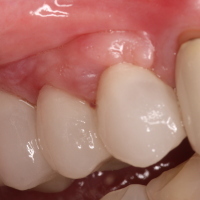 Periodontal disease typically does not cause pain until it’s in an advanced stage, at which point much of the damage has been done and tooth support destroyed. If anyone in your family has had gum disease, you are also at risk – even if your oral hygiene is perfect. Periodontal disease has a hereditary component, so if you know your parents’ oral health included gum disease, or if they lost their teeth at an early age, we recommend frequent screenings. If you are predisposed, so are your children. Red, swollen or tender gums or other mouth pain. To aid in the prevention of periodontal disease, Dr. Lanman recommends establishing good oral hygiene habits including brushing at least twice a day, flossing daily, and discussing gum health with a dental professional.To learn more, patients can take a brief quiz on perio.org to evaluate the current state of their gum health, learn the signs and symptoms of periodontal disease, and receive tips on how to properly care for your gums. If you have any concerns about the health of your gums, please feel free to call our office.